Sep. 14, 2017 8:00 a.m.
Making the Tragically Hip tour documentary “Long Time Running” was a shotgun project of sorts for its filmmakers. “It started on a dime,” explained co-director Nicholas de Pencier on Wednesday during the film’s red carpet premiere at the Toronto International Film Festival. “Five days before the first show,” added Jennifer Baichwal, the film’s other director. But they say getting the chance to follow the Hip on their defining “Man Machine Poem” tour was an opportunity they couldn’t pass up. 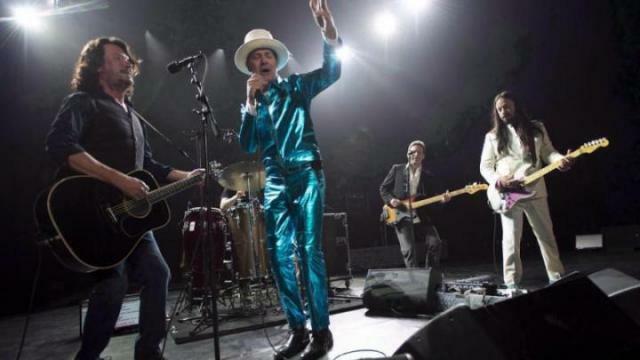 The documentary follows the Canadian band as they embark on run of farewell shows and face the reality of Gord Downie’s incurable brain cancer diagnosis. The Hip frontman was absent from the premiere, though his bandmates Gord Sinclair, Johnny Fay, Rob Baker and Paul Langlois all showed up. They declined to speak with reporters about the making of the film. Unlike most projects, the filmmakers say this one came together almost on the fly. Downie’s health condition meant the band was never entirely certain if they’d be able to complete the tour. “Normally there’s a lot of preparation,” de Pencier added. The documentary makers say knowing the Hip band members personally for 20 years helped them get accustomed to the touring atmosphere. “It’s not that we wanted to do it, it’s that we were asked to do it,” Baichwal said. — with files from Shetu Modi.